You'll find this high-end, comfortably furnished, stunning, detached chalet on the edge of the lively town of Krimml, known for the highest waterfall in Europe and for its connection to the Zillertal Arena skiing area. 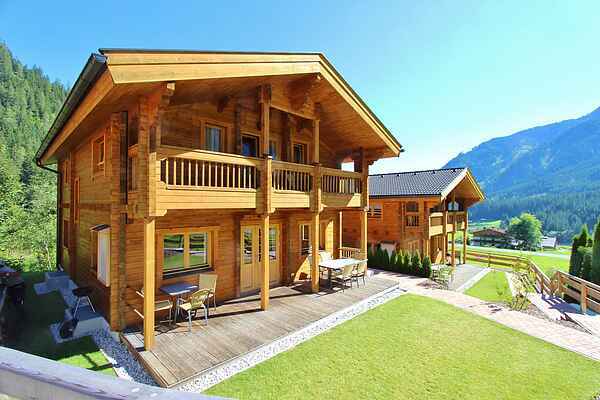 The chalet is built entirely out of wood and is attractively decorated. The large living room, with lovely fireplace, offers enough space for 12 people. Besides four bedrooms and three bedrooms, the holiday home also offers private wellness facilities. Total comfort! It goes without saying that you can make use of the large garden with terrace. The amazing mountain views (across the Hohe Tauern National Park) will give you the ultimate holiday feeling. The town of Krimml is known for the remarkable highest waterfall in Europe. Magnificent! It only takes a few minutes on the free ski bus (winter only) or by car, to the Zillertal Arena skiing area. Winter sports lovers will enjoy this very large skiing area where snow is guaranteed. The area is great for hiking, cross-country skiing and ski touring, too.